Gashapon, toys and figures that come in plastic eggs that can be bought from special vending machines, are a big thing in Japan, and pretty much any series worth it’s salt will have a range of gashapon toys released for it. Love Hina has a huge amount of toys and figures available for it, and amongst them is this range of gashapon toys based on some of the main female characters from the series. The range consists of five figures – Naru Narusegawa, Motoko Aoyama, Koalla Su, Shinobu Maehara and Mutsumi Otohime – all of which would normally be purchased ‘blind’, meaning that when you put your money in the slot you don't know which of the five figures you will get. As with all gashapon (so named after the ‘gasha’ noise the machine makes when it vends) the focus is on cheap and cheerful and, with the price per vend varying from the equivalent of 50p to £1.50, you know that the quality isn’t going to be very high. 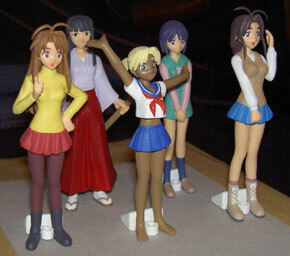 These Love Hina figures come from the lower end of the gashapon price range and the quality matches the price tag. All five figures require basic assembly, as with most gashapon they are broken down into parts to allow them to fit into the plastic egg, but they fit together easily and firmly with no need for glue. making them instantly recognisable, but the first problem is soon apparent. Whilst the level of detail and quality of painting is ok, it is pretty much what you would expect for 100yen gashapon figures. What the figures need to set them apart is some originality in the design to give them some life, but they are instead depicted standing bolt upright like mannequins. There are touches of thought given to their costumes and expressions but their pose is unremarkable and detracts from the impact of them as display figures. It is also infuriating that because of the shape of the egg, long straight pieces such as Motoko’s sword are often bent when you get them and it’s near impossible to bend them straight again. At the end of the day it depends on what you want. In Japan gashapon toys are intended as pocket money collectibles and the lower quality is fine when you are paying less than a quid for each figure. However, in the UK they would cost more and are harder to come by, with this in mind would you rather get one figure that looks a lot better or five that are pretty much average? These Love Hina gashapon do have some charm and won’t cost more than a few quid each but there are better figures and gashapon ranges available. One for Love Hina purists only. All of the figures come with white wedge shaped plastic stands, which are essential as the figures’ pose generally leaves them top-heavy and they fall over if you so much as breathe near them. Unfortunately the stands themselves are pretty ugly and chunky, and also do not always clip to the characters very well. This makes them only partly effective – some of the characters still fall over with them on, it just takes longer.